Estus D. “Pete” Simmons died March 14 1960 at Sheridan, Washintgon, Louisiana. Estus D. Simmons of Sheridan died at 6:30 this morning at the family residence in Sheridan. He was 52. The funeral party will leave the residence at 4 p.m. tomorrow for the Simmons Cemetery, where graveside rites will be conducted by the Rev. J. W. Magee and the Rev. J. B. Rocko. The Brown Funeral Home is in charge of arrangements. 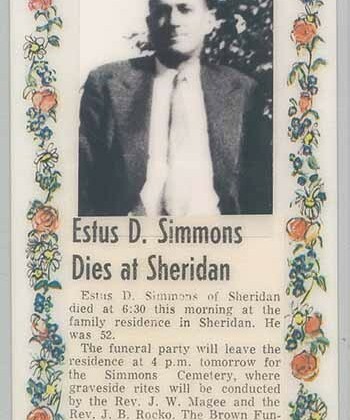 Simmons is survived by his wife, Mrs. Genieva Simmons; a son, Denman Simmons, serving in the Air Force at Clovis Air Force Base, N.M.; his parents, Mr. and Mrs. Lucius Simmons of Sheridan; three brothers, Ezra of Slidell, Lloyd of Freeport, Texas, and Jim of Sheridan; and two sisters, Mrs. Ethel Hennesey of Camden, Ark., and Mrs. Fannie Lee Foil of Franklinton.